Yeah, finally a proper update! I'm neglecting this blog like hell, but probably because I had little interesting to say. Reading through a few blogs I decided I want to keep this blog on topic as much as possible. If you want to read some of my other thoughs, ramblings and musings, or see some of the other art I create, please visit my LJ journal (see side bar for a link). I don't think everyone wants to read my stuff about daily life, so it's better to make a choice. Now one quick note about the things in the US. I really care for those people and support the things that have been sat up to gather money for the Red Cross and other organisations. I have been thinking about selling some of my yarn, and I'll get pictures of it soon. Half of what I make from this sale (at least) will go to the Red Cross or some animal rescue organisation, the other half will go towards the yarn for a cardigan for my grandfather. Anything I don't need for the cardigan will as well go to the Red Cross. I'll let you know soon. Now I have a ton of pictures, though I think I'm still missing stuff. So here I go. I'm working on quite a few things right now, but only have pictures of 2 things. First, there's the Amble socks for the SixSocksKAL . I'm on the foot of the first sock and really like the pattern, though I made a few minor mistakes (which I didn't corrected, but you can really notice them) and had to rip back 2 times, but nothing big really. they are going smoothly now. I'm kinda franatically knitting on this one as it's my first sweater and I hope it turns out nicely. I'm working the body in the round - the pattern is from a dutch magazine and those haven't really discovered knitting in the round yet :D - and I'll to the sleeves the same way. I made a few mistakes but I don't htink they'll show. You can see the huge ball in the up corner. 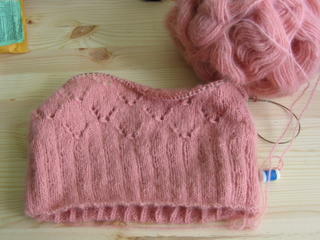 It's pink, I wanted black, but the only colour availabe was pink and I wanted to use the yarn mentionned in the pattern. More pictures later! The other 2 WIPs I'm having is my Clapotis which I really should start working on, I want to finish it soon 'cause i really want to start wearing it when the weather starts cooling down. The other are the Friday Harbor socks for the KOTR-sock-KAL . I've had one finished since I returned from Italy, so I really need to cast on for the second sock! Well, ok, the next sock I'm going to start are the Feather and Fan socks (from the Socks-Socks-Socks book) for the Socks3KAL . I got some Regia Silk for them, in creamy white. 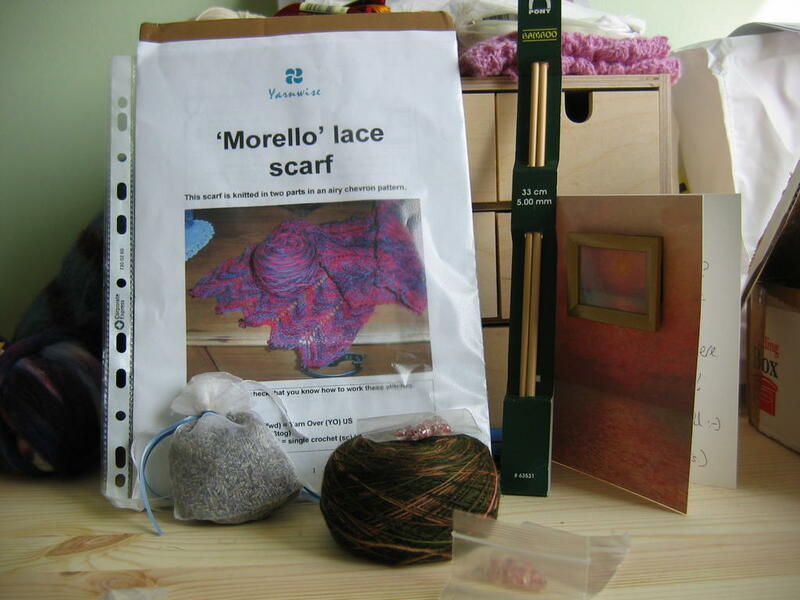 I have the book and this is a great way to start knitting some of the patterns! I might also become a moderator of the group! There are a few Christmas projects I should get started on. The above mentionned cardigan for my grandfather as soon as I have the yarn (and I'll post a picture of the pattern then), a scarf (probably Branching Out) for my grandmother, and 2 pairs of felted slippers (for my mom and my aunt - the last one asked me for warm handknitted socks at the end of last Winter to wear around the house as she always has cold feet so I think felted slippers will do the trick!). Then there's still a pair of socks I need to knit up for my sister but I know she's not impatient about them, so those are on hold for a while. For myself I really want to knit some fingerless gloves! Plus a pair of Self striping socks! And i want to start a lacy shawl but I haven't decided on the pattern yet. I have this one sweater I want to knit from a Dutch magazine, it's a basic pattern for a turtle neck sweater, my favourite one actually and I'm so excited I found this pattern! 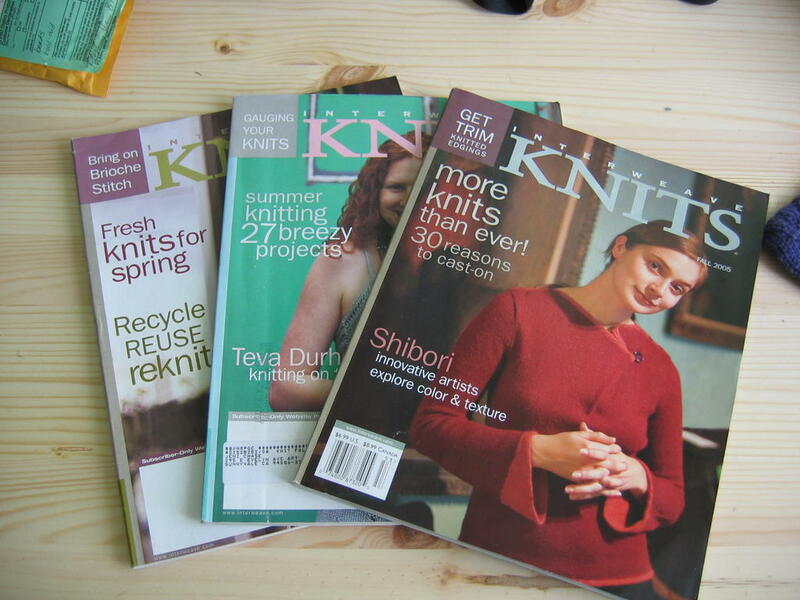 I'll be knitting quite some of those! 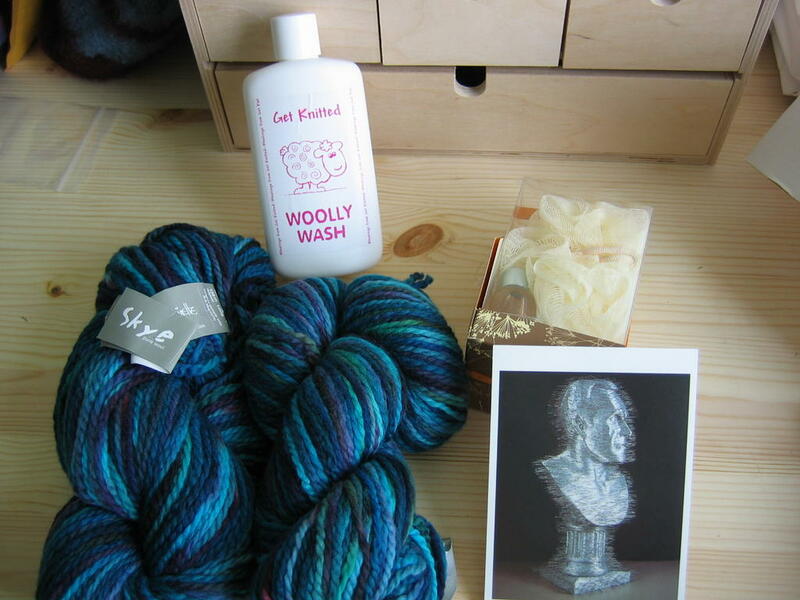 I ordered yarn from KnitPicks for it plus I also have some Cashmere/Wool blend for one ,but more on that later. I already have the yarn for the one in the middle, found the recommanded yarn in a store near my work! It's such a great store! With lovely yarns! Got the previous mentionned Cashmere/wool blend there, and an Angora/Wool blend for a scarf (this one to be exact! :D), and the silk for the socks. I want the Rowan for the first sweater, and I'm not sure yet what I'll get for the last one. Maybe some more of the Alpaca used for the middle one. There's one more sweater I don't have a picture scanned off, it's the wrap in the same IK. It's in pure Cashmere which I of course don't have, so I have to find a proper replacement. But I really like wraps so it'll probably become my basic pattern. Then there's also this Hot Lave Cardigan from Blue Alvarez Designs which i wanted to knit ever since I came across the pattern! This pattern from White Lies Designs I really, really want! This type of cardigan is highly popular over here for the Winter and I already have a similar one from last Winter, so being able to knit one myself would be so great! This wrap from Lana Grossa, I'm going to use pure black mohair. To much you say? Hmm, you could be right! :D And this isn't even everything! But hey, the Winter is still very long! And I anticipate and a few Sundays alone, not to mention the evenings ... . There were quite a few packages in my mailbox the last couple of weeks! Unfortunately the huge sock yarn order from Canada which I made at the beginning of July still hasn't showed up and a gift package from Amanda hasn't showed up yet while the KnitPicks order she mailed to me later did show up. Disturbing really! It's a scarf pattern, with the yarn for it in some super nice, lovely colours (pink and dark olive green, yum!!! ), the neeldes for it (bamboo :D) and the beads! Plus a little bag of Lavender and a lovely card! This was just a wauw package! Some gorgious 100% wool yarn in superb colours! 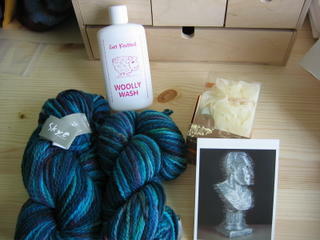 A little kit of vanilla stuff from the Body Shop (one of my most loved stores), a nice card and a great bottle of woolly wash from Get Knitted! My SP5 pal has recieved her package today with the reviel in it. 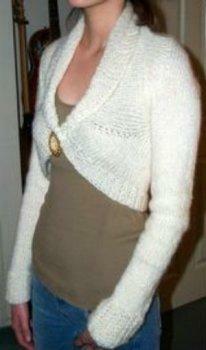 I of course forgot to add something I knitted for her which I mail her soon. I won't show now as of course she now knows my blog! 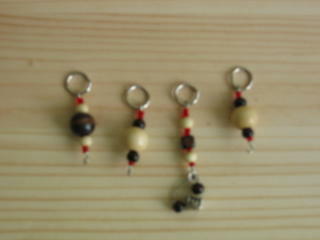 These are the stitch markers I got through the SP Stitch marker swap ! Very, very lovely! I urgently need to send mine out for September, will do so tomorrow! That's it for tonight, more for a later time. I'm going to get some spinning done now! Before I fall asleep that is! Darn, LOL was hoping for a sneak peak ;-) Just got pics posted of your wonderful package of goodies and wanted to come thank you again for all your wonderful spoiling! If you ever need a SP reference LOL use me! And hey, if you ever need another KnitPIcks enabler, er, I mean forwarder, just let me know, I would be more than happy to send it (or anything else) your way! THANK YOU EM for being such a wonderful Secret Pal!! The sweater you are knitting really looks great! Few days ago I noticed that lacey wrap from LG. I will really have to work to get those surplus kilos - I would look funny with my weight and that wrap! And one observation - the world is such a small place; You SP Steph - guess who was Steph's? Ofcourse - me!